How do you solve a problem like civet coffee? Well, first it has to be identified as a problem. At up to $600 a pound, it's regarded as the world's most expensive cup of joe - but that figure doesn't include the cost to the civet cats who are forced to digest the coffee beans. In an interview with Wired Magazine, synthetic biologist Camille Delebecque likens the coffee to foie gras. 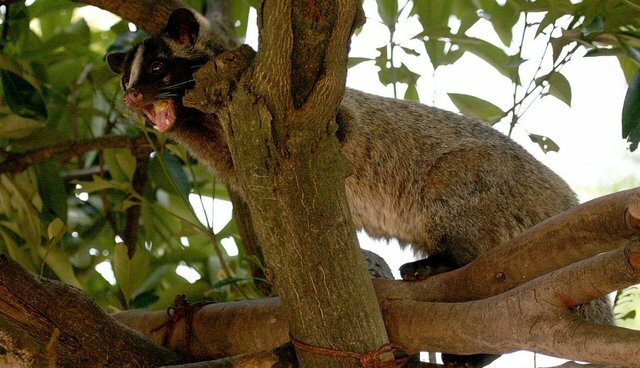 But instead of geese being force-fed corn, Indonesian farmers feed coffee cherries to the small, mongoose-like civet cats. Not only are farmed civets kept in mesh cages, thousands of are poached every year as part of the civet coffee industry, according to the World Society for the Protection of Animals. The scientists' goal is to mimic what happens to coffee beans as they tumble through a civet's gut. Rather than civet digestion, however, they're turning to microbes to ferment the beans. It won't be a perfect copy, but the researchers think the end product is tasty enough to warrant a $50 or $100 per pound price tag. Afineur's faux civet coffee won't go on the market until next year at the earliest. But whenever it does, that will be a great day for civet cats.